With the Nintendo Switch launch date a mere two weeks away, it was only a matter of time before someone posted a video of themselves playing around with the new hardware. Lo and behold, today on NeoGAF a guy going by the username hiphoptherobot did just that. 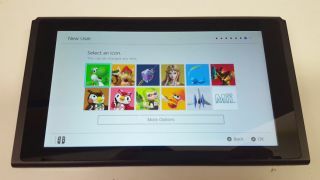 The NeoGAF user posted a short three-minute video of himself playing around with the Nintendo Switch’s start-up screen before walking us through the system’s home and settings menus. It's a bit dry, honestly, but it does provide our first look at what the system's user interface is going to look like. That being said, there aren’t many gems to be mined from the video, with the exception of the data storage screen. The menu shows that a brand-new Nintendo Switch has about 30GB of free space – meaning the hard drive is about 32GB, the same size as the Deluxe Edition of the Wii U. The video shows us our first look at the Switch’s user interface – a simple, straightforward one by the looks of things. It’s reminiscent of the Nintendo 3DS start screen, if you’ve ever seen that, or a condensed version of the Wii’s interface. Hiphoptherobot wouldn’t give us the location of where he got his unit early, instead citing that it came from an “unnamed store” who decided to ship him an early Switch. Too bad this “unnamed store” couldn’t ship him any games to go along with the console.